Argentine Alfajores biscuit were a firm favourite along side the many other dessert and sweet items containing “dulche de leche” or sweet milk all over Argentina. In Posadas we were told that most people simply boil a can of sweetened condensed milk for a few hours and it is ready to use when you need it. More recently we have learnt that there are different ways of making dulche de leche, but that the can method is the easiest and more suitable for making large quantities at one time. Due to the Argentines using it as a breakfast spread, in desserts and in biscuits, which are regularly consumed being able to make a large amount is crucial! In a large pan Add the can of condensed milk (unopened, but without the lable) and fill with boiling water from the kettle, so water covers the can with at least 1 cm water. Place over a medium flame so the water continues to gently boil and cook for 2 hours. Check every so often to check the water continues to cover the can with plenty of water. In the meantime sift the dry ingredients together through a sieve. Whisk both the sugar and butter together until they bind together and lots of air is beaten in. Separate the egg yolks and add into the butter mix, whisking continuously. Next, slowly fold the flour into the egg mixture a bit at a time until they have been thoroughly combined. Now add the brandy and work in carefully bringing the mixture together into a soft dough, add more brandy if the dough breaks apart easily or there is dry mixture left in the bowl after it has been mixed together well. Roll the dough out for the Alfajores so it is 1cm thick and then cut into 5 cm in diameter circles, which should form around 20 circles and therefore 10 biscuits. Bake on greaseproof paper at 180C for 10- 15 minutes, or until the biscuits are start to turn brown. Leave to cool on a rack. When the can of condensed milk has been boiling for 2 hours remove from the water and leave to cool for 20 minutes at room temperature. Open the can carefully using a can opener and given the contents a good stir. 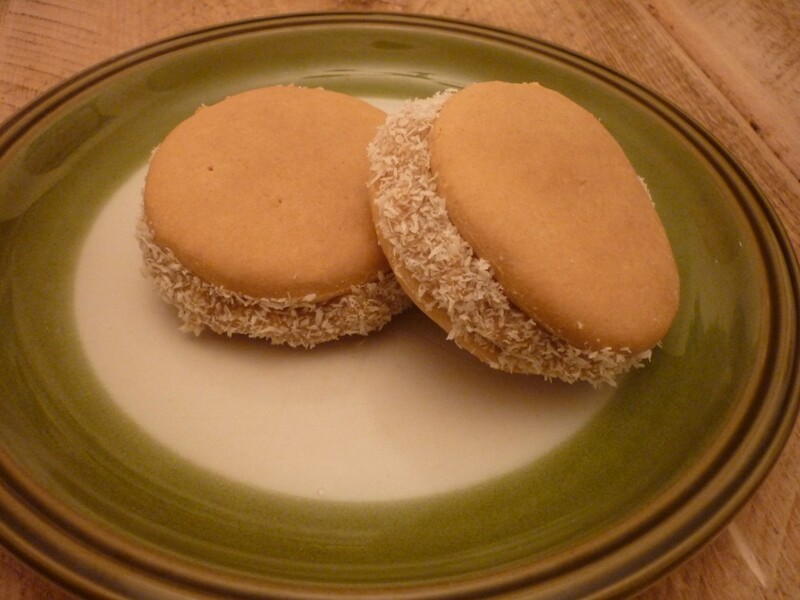 Take a plate and spread the Alfajores evenly with the desiccate coconut. Spread one heaped teaspoon of dulche de leche into the centre of one biscuit and press another on top until a little emerges the sides (max a few millimeters). Roll the edge of the biscuit in the desiccated coconut and leave on a tray for serving.